I must say that I am going to enjoy writing all about the 10th Mountain Division. The 10th is a light infantry division that continues to defend our great country. I am going to take you through the various campaigns the 10th Mountain Division has participated in and the decorations they have received. Now there was a 10th Division organized in 1918 but never deployed to World War I. That division demobilized and was redesignated the Panana Canal Division and has no relation to the 10th Mountain Division. It was the Founder and President of the National Ski Patrol, Charles “Minnie” Dole who convinced the War Department and General George Marshall that the U.S. Army needed a division which could fight in harsh conditions. Seeing that other countries had successfully created similar units, the War Department agreed and the first Mountain unit was activated the day after the Japanese bombed Pearl Harbor. That was the 87th Infantry Regiment which would become a part of the 10th Mountain Division. The 10th was formed in July of 1943 and the Commander was Brigadier General Lloyd Jones. The 10th Mountain Division faced several challenges immediately. The numbers were low so troops were transferred from other divisions and made morale low because of the inferior training the transferred soldiers had. In 1945, the division was deployed to Italy. Their first task was in conjunction with the 1st Brazilian Infantry Division and Operation Encore where they were tasked with clearing enemy artillery from the Northern Apennines. Fighting was fierce through these mountains, but the 10th performed above par. They fought all the way to the outskirts of Bologna and defended their position for 3 weeks assuming the Axis would counter. They continued moving forward and swept the high and low grounds of Italy. Moving into Austria, the 10th Mountain Division took many prisoners. The 10th Mountain Division proved their abilities. They were scheduled to be sent to invade Japan, but that was canceled after the bombing of Hiroshima and Nagasaki. The 10th Mountain Division was given 2 campaign streamers for the Northern Appenines and Po Valley. 1 Medal of Honor was given posthumously to a 10th soldier… That was to PFC John McGrath. 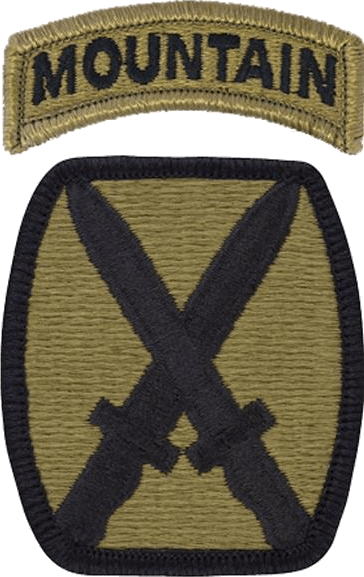 There were also 3 Distinguished Service Crosses, 1 Distinguished Service Medal and various others awards given to members of the 10th Mountain Division. In 1948, the 10th was reactivated and served as a training division at Fort Riley, Kansas. They trained over 120,000 new soldiers by 1953. The division was never deployed to Korea. In 1954, the 10th was deployed to Germany as a NATO defensive force. It was again inactivated in 1958. In 1985, the 10th Mountain Division was reactivated at Fort Drum, New York. The Army knew they could be a rapid deployment division and trained as such. 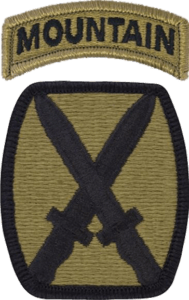 The 10th deployed approximately 1,200 soldiers to Operation Desert Storm with the majority with the 548th Supply Battalion who supported the 24th Infantry Division. Andrew caused destruction and chaos in Florida. The 10th Mountain Division became Task Force Mountain and set up shelters, passed out food and water, clothing and medical supplies. Not long after Hurricane Andrew, the Army engaged in Operation Restore Hope in Somalia. The 10th Mountain Division provided similar services to Somali natives as they had in Florida. During the Battle of Mogadishu, the 10th provided infantry and 2 soldiers were killed in that battle. To keep a democracy in Haiti, the 10th Mountain Division was a primary division in a multinational task force who occupied the Port au Prince airport and ensured democratic elections and stability in the region. In 1998, the 10th served as Headquarters Task Force Eagle as a peacekeeping force in Bosnia. Around 3,000 soldiers from the 10th deployed. In 2000, the duties were transferred to 49th Armored Division. The 10th Mountain Division has been an integral part of the seemingly never ending war and conflict in these 2 countries. The 10th was also the first to have K9 services with bomb sniffing dogs. And most recently, the 10th Mountain Division deployed for Operation Atlantic Resolve. The 10th Mountain Division has had some great soldiers and will continue to be a major division serving our country. If you or someone you know served in the 10th Mountain Division, please tell us more. Thank you to all who have served or continue to serve.